The ratio of wealth to household income in the U.S., a measure of inequality, is the highest it has been since just before the Great Depression, Credit Suisse noted in a 64-page report on global wealth released on Monday. The bank also warned that this was not good news for the health of the economy: “This is a worrying signal given that abnormally high wealth income ratios have always signaled recession in the past,” the bank wrote. Meanwhile, the richest 1 percent in the world own 48 percent of all the world’s wealth, according to Credit Suisse — a worrying signal for the global economy. You know inequality is getting bad when it’s making a Swiss bank uncomfortable. “This is a worrying signal given that abnormally high wealth income ratios have always signaled recession in the past,” the bank wrote. Meanwhile, the richest 1 percent in the world own 48 percent of all the world’s wealth, according to Credit Suisse — a worrying signal for the global economy. 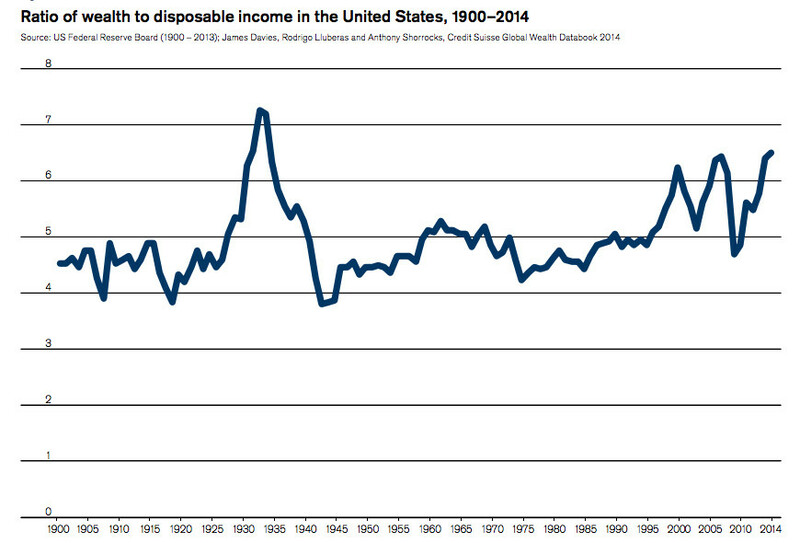 Because wealth is a big pile of money that has been built up over the years, and income is a much smaller annual flow of new money, this ratio is always pretty high: Going back to 1900, wealth has always been at least four times as high as disposable income. But sometimes the country’s wealth stockpile surges to even greater heights. Right before the Great Depression, there was seven times as much wealth in the country as disposable income. Right before the dot-com and housing bubbles burst, there was six times as much wealth as income. See a pattern there? This ratio tends to get out of whack when bubbles of one sort or another have been built up, This typically ends badly, very badly. Today the ratio is higher than at the peak of the dot-com and housing bubbles. So, yikes. This time could always be different, of course. You could argue that there’s no bubble today that’s nearly as ridiculous and dire as the dot-com or housing bubbles. Most of the wealth build-up of recent years has been due to the stock market soaring to record highs. There is at least some justification for record-high stock prices, given that corporate profits are at record highs, too. Then again, the stock market that has been inflated at least partly by historic levels of Federal Reserve stimulus. And corporate profits are at record highs at least partly because companies are being so stingy with workers: Wages have been flat throughout the recovery and for the past few decades, really, when you adjust for inflation. Whether we get a recession this time or not, this news is at least a sign that French economist Thomas Piketty is on to something when he warns that wealth tends to grow more quickly than income, leading to dangerous imbalances.